SAN DIEGO – The San Diego Padres announced today that they will host their first-ever, week-long Padres Fantasy Camp at the Peoria Sports Complex, the club’s official Spring Training facility, from January 20-26, 2019. As part of the once-in-a-lifetime opportunity, each participant will also have their own dedicated locker in the Major League clubhouse where they will be able to hang their full Padres uniform consisting of a home and away jersey, pants, socks, belt and dry fit shirt, and store their Padres duffle bag. Breakfast and lunch will be provided each day in the team cafeteria to allow participants to be properly fueled as they live out their dreams of being big leaguers. At the conclusion of the fun-filled week, all guests will be treated to a special post-camp banquet, and each participant will return home with a variety of special gifts to remember their week as a pro. The five-day, six-night camp includes hotel accommodations and is open to any fan over the age of 25. 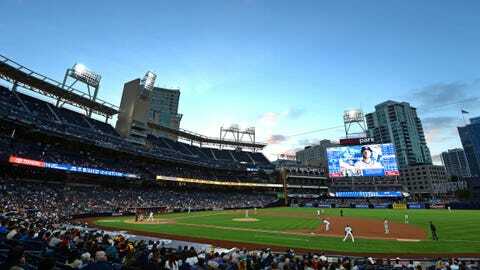 Padres members will have access to a dedicated pre-sale starting today, with registration for the general public beginning Thursday, June 14 at 10:00 a.m. Proceeds from the fantasy camp benefit the Padres Foundation. For more information, or to register for the Padres Fantasy Camp, visit www.padres.com/fantasycamp.